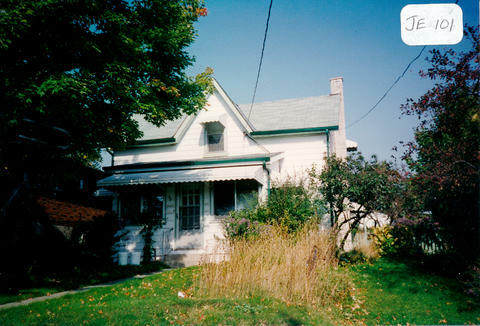 The mid-block building located on the north side at 101 John St. East was built pre-1900 in the Gothic Revival Cottage style. Originally, there was a woodshed across the back. It was the home of Mrs. Leduc or Mrs. Paul Courier, a French descendant from the old lumber mills. She wove rugs and blankets and repaired clothing. After her death the house was rented. Howard Robson and his wife lived here with part of their family, namely, Alvin, Garret and Phyllis. The building then became the home of Henry Pringle and his wife Joan. He was a retired railroad section man and owner of a garage on Holland Street. It was still the home of Joan Pringle when this photo was taken in 1995. The 1½-storey, three-bay house has a rectangular plan, a centre hall, and a symmetrical façade.